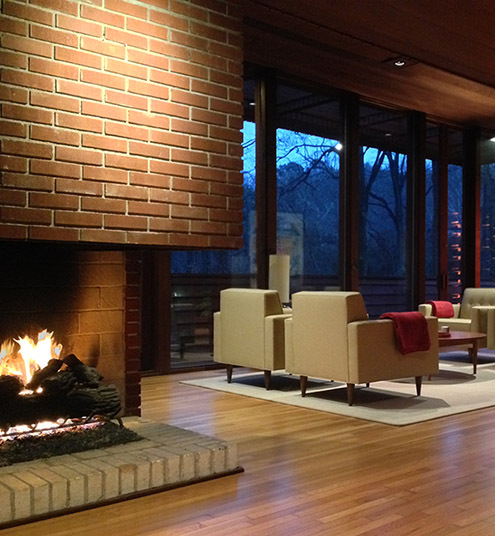 Wright Chat :: View topic - Cantilevered Fireplace Lintel - How? 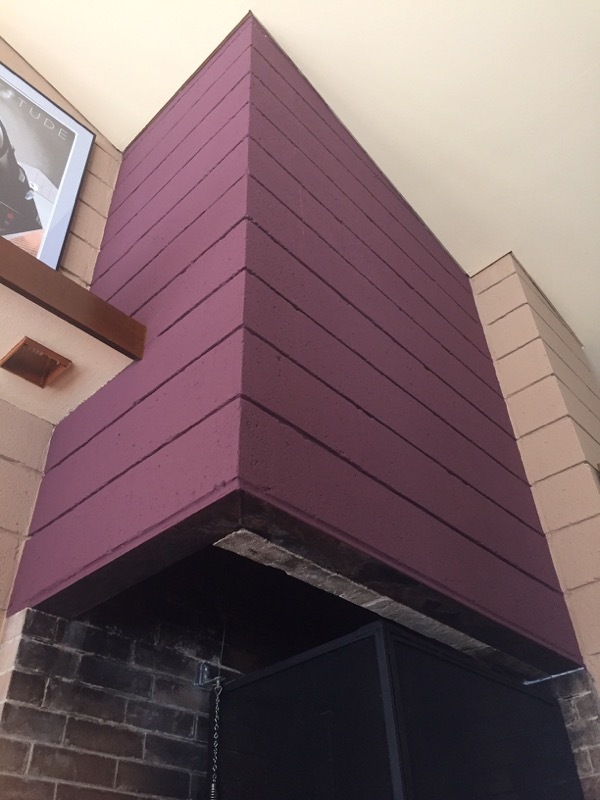 Cantilevered Fireplace Lintel - How? 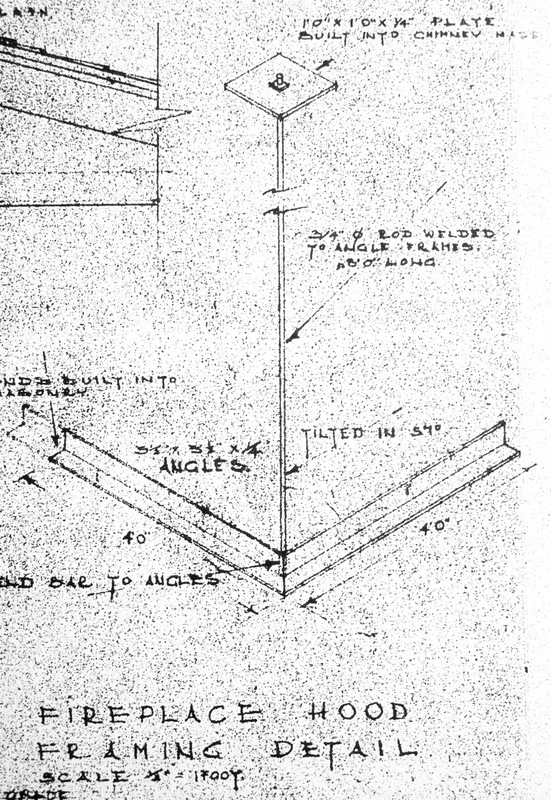 Posted: Mon Mar 04, 2019 2:23 am Post subject: Cantilevered Fireplace Lintel - How? 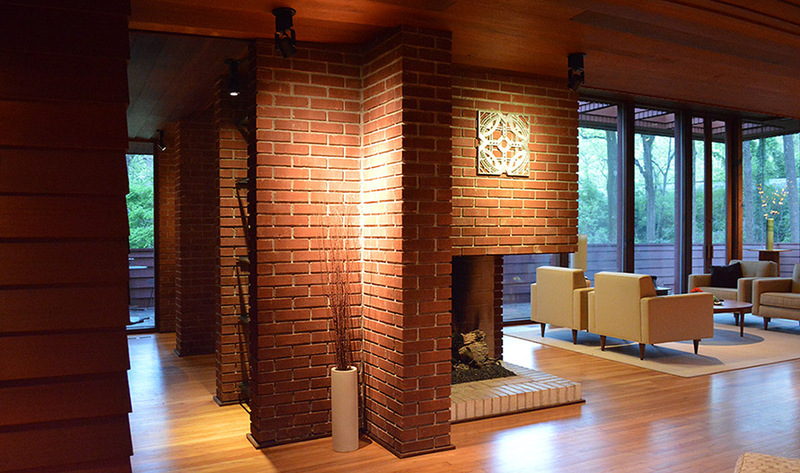 I'm trying to understand how this "cantilevered" fireplace was built. What is supporting all those bricks above the lintel? 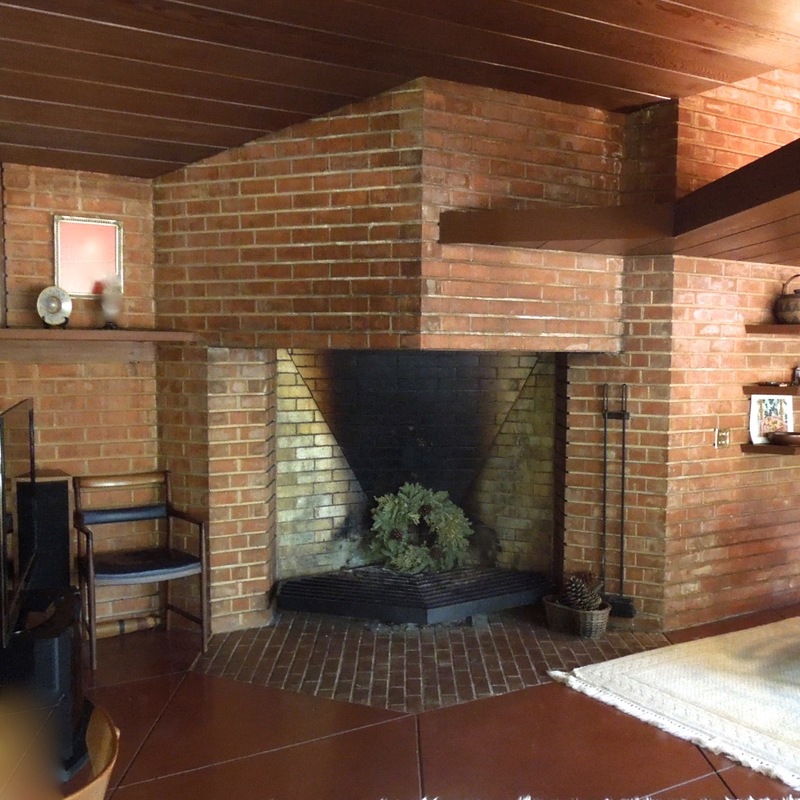 I have seen how a metal bracket can be used as a bridge, but so many of Wright's brick fireplaces have this mass of weight that wouldn't seem possible to support with such a method. This is the Cooke house. is called out at 3/4" dia. by eight feet. of the chimney mass. 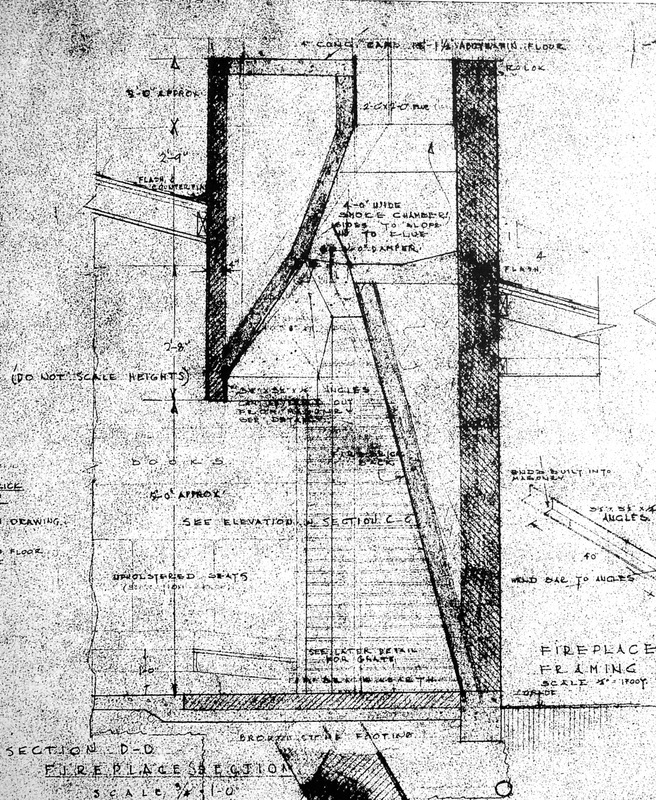 Presumably, another one projects from the other wall, at ninety degrees to the first, and anchored by the conveniently-placed slab visible in the section ? Did an apprentice provide the supplementary isometric diagram with improved structure---increasing the size of the angles, and doubling them ? DRN will post documentation from the Sweeton residence, of which he is the current steward. 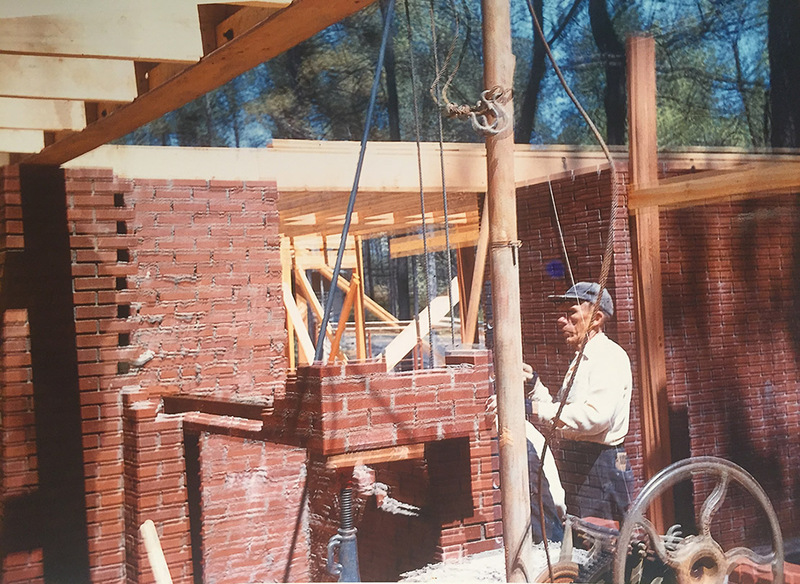 The cantilevered 8" CMU hood at the 1950 Sweeton house. 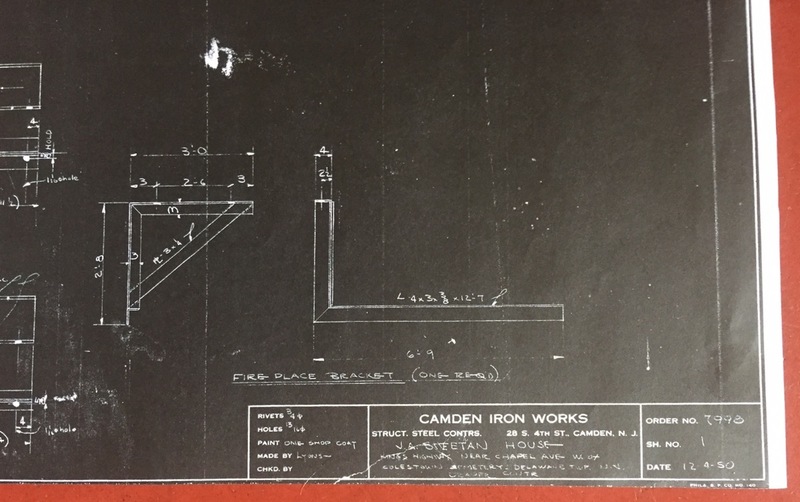 A portion of the steel shop drawing indicating the angle bracket in elevation (turned 90 degrees to orient with the lintel plan to the right), and the steel angle corner lintel in plan. 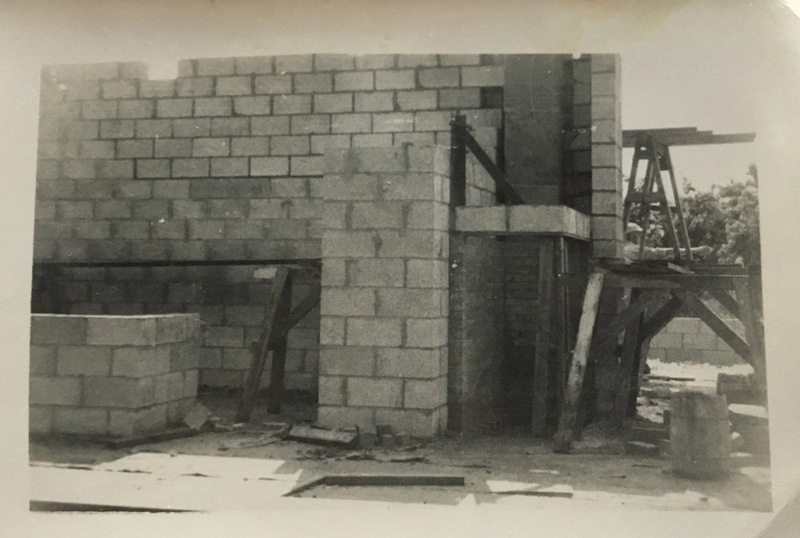 A construction photo from Summer 1951 showing the angle bracket in place with the hood masonry just beginning to be placed. A portion of the angle bracket visible in the hood today. That Cooke fireplace is unusual, isn't it . . . I haven't seen a fireplace---Wright's or anyone's---with a "mezzanine level" running right around the inside of the firebox . . . necessitating a custom-made unequal-legged grate. I've got some construction photos of the fireplace where I live (Copeland House by apprentice R Green). They show a steel lintel temporarily support by a screw jack while a mason works his way up the surrounding brick wall. There is a diagonal steel rod in place (but we can't see where it terminates at the top). 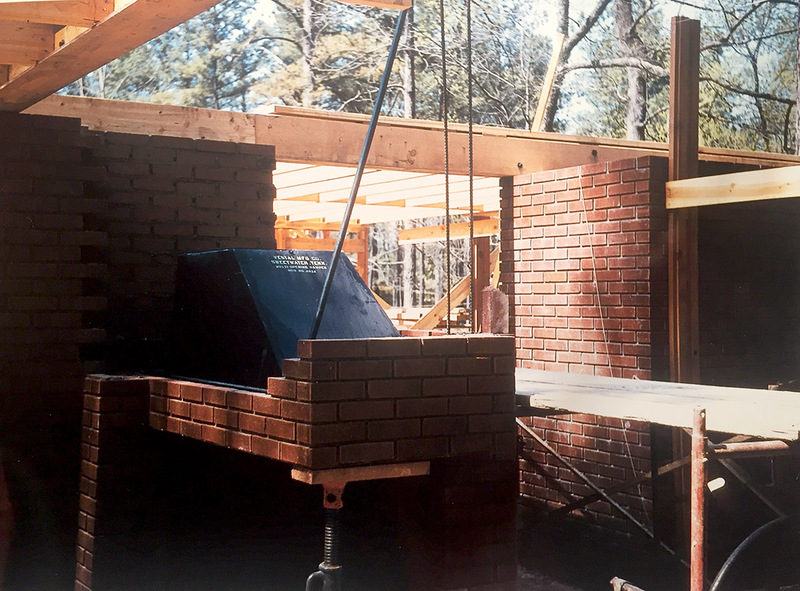 In a subsequent image, a couple of brick courses higher, we see the damper installed. 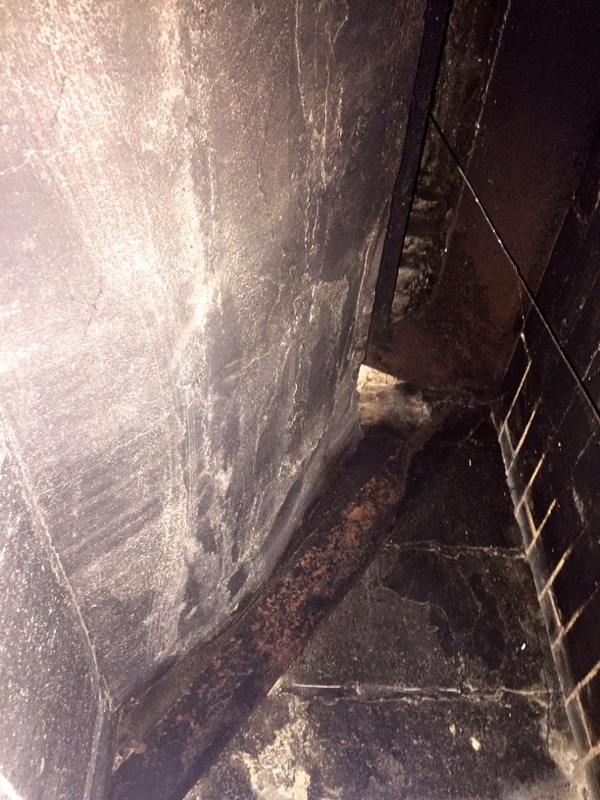 There is a pair of steel rebar emerging vertically from the corner of the back wall of the fireplace. I wish I could see how those components were resolved at the top end because I'm not sure how the diagonal rod is supported. Perhaps, the steel rebar indicates that a grouted reinforced vertical pier is being incorporated into the masonry of the chimney structure. 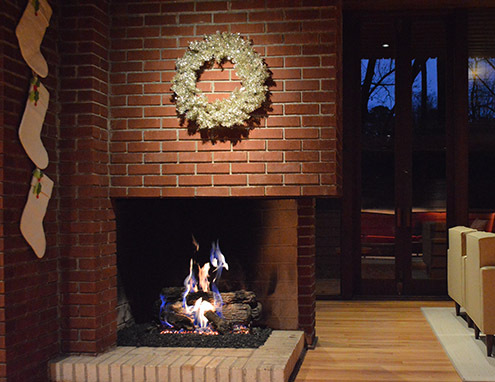 By the way, funky fireplaces like these are tricky at Christmas. My 3 kids are adults now, but my wife is still compelled to hang their stockings by the chimney with care. Great to see those construction photos. Do you suppose (or know) whether Mr Green took them ? Can anything be seen inside the firebox ? I suppose you've looked. I have one of those confounded memories, of Mathews, where either l looked and saw the rod, or I'm recalling instead what I expected to see, after looking at the drawings. Very helpful drawings, SDR! Thank you. That rod explains a lot. Wow! Great photos that really illustrate the mechanics and how it's done. 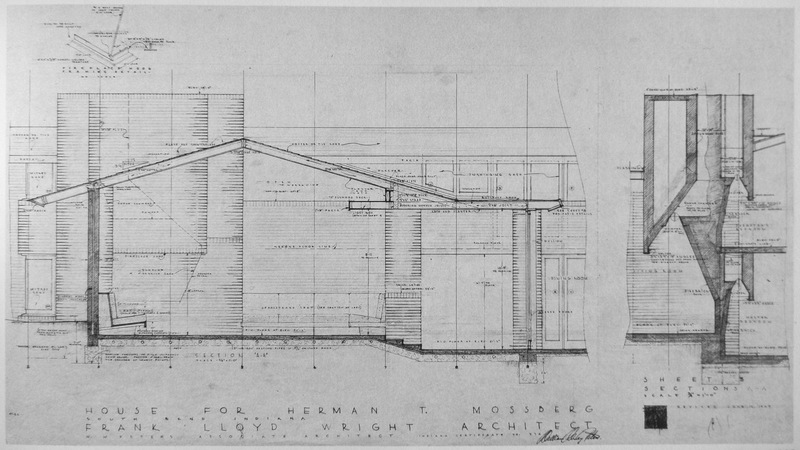 It appears that architect Robert Green, an acknowledged devotee of Wright's work and a talented designer in his own right, either discovered this little Taliesin detail, or invented for himself . . . unless it is something familiar to a broader swath of chimney masons ? 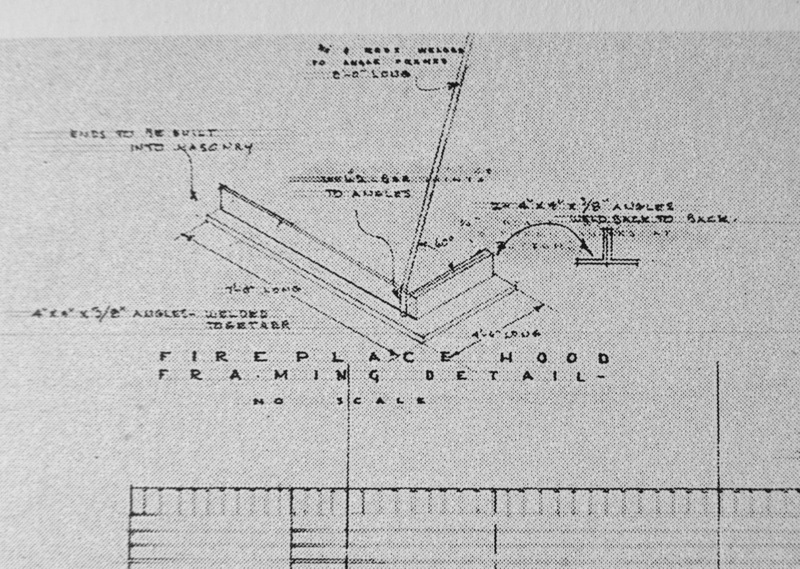 I doubt FLW could claim invention of this construction. 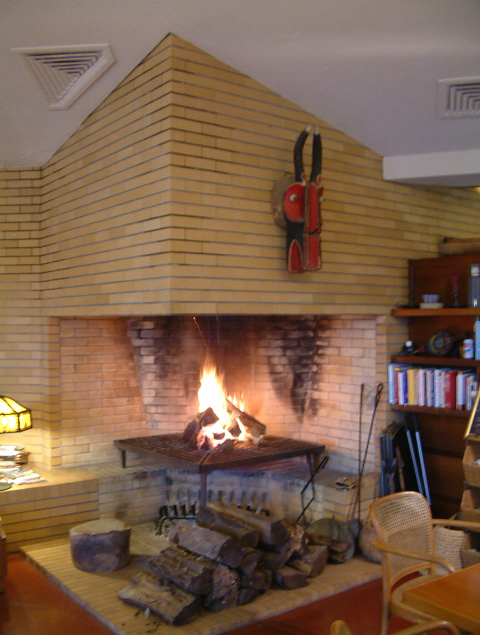 The fireplace in my parents' house (1960) was a simple flat surface with an opening, no hint of anything cantilevered or hung out to dry, and it had the steel support with diagonal braces hooked to plates at the top end, held in place by the chimney brickwork. 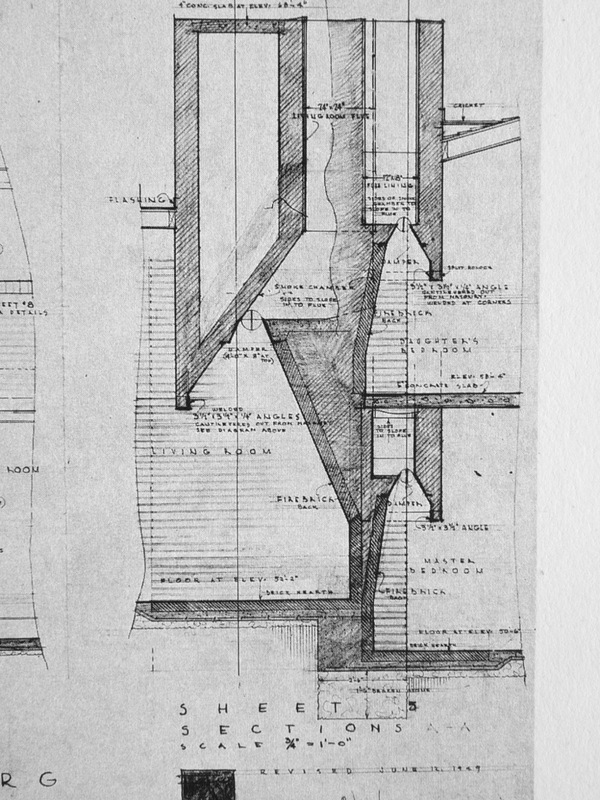 Detail from the Mathews residence drawings. 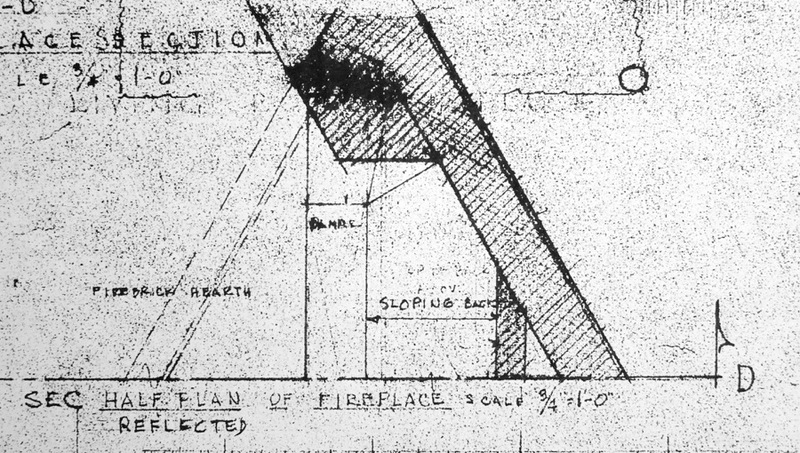 The fireplace hood follows the plan geometry of the house; the isometric drawing could be read as a plan view of the hood, two equal legs at 120º.